TWEEZER BOTTOM @ 4911 – 16/09/2011. The market faced a double whammy in the form of a petrol price hike of Rs.3 per litre and a 25 bps hike in the interest rate. The RBI continued with its policy of fighting inflation by increasing interest rates once again. In its bid to reinforce its commitment, RBI raised the Repo rate by 25bps to 8.25% and the Reverse Repo by 25bps to 7.25%. Surprisingly the single minded focus of the RBI is slightly worrying because it is still assuming that the economy will grow by 7% and hence all its actions are targeted towards moderating inflation. The market survived the hike in petrol price and interest rate by losing its intraday gains but still managing a flat to positive close. The indices have formed a Tweezer bottom at Nifty 4911, if we consider Monday and Tuesday’s candlestick patterns, and hence in the current scenario this level assumes significance. Tweezer bottoms provide support to the market and hence a pull-back rally was to be expected and it did happen. Infact one can presume that the pull-back rally from low of Sensex 15765 and Nifty 4720 continues. This pull-back rally will be on as long as the low of 4911 holds. Currently Nifty is trading in a small range of 4900 to 5200. The Sensex opened the week at 16668, made a high of 17122, a low of 16374 and closed the week at 16933. The Sensex gained 67 points on a weekly basis. Similarly Nifty opened the week at 4981, made a high of 5143, a low of 4911 and closed the week at 5084. The Nifty too closed with a weekly gain of 25 points. The market was not able to hold on to the gains recorded in the first half of Friday as the RBI announced an increase in interest rate. Though both the indices have formed a black body candle on the daily charts on Friday, the entire candle body is above the previous day’s body. Hence this cannot be termed as entirely a bearish formation. On the weekly charts both the indices have formed a white body candle which is engulfing the previous weeks white body. The formation was very close to forming a Bullish Side by Side White Lines, if we take into account last three weeks candle formation. But there is no gap between the first week and the second weeks candle and hence it cannot be regarded as Side by Side White Lines. Thus on the weekly charts, it is nothing but a continuation of the short term upmove. Nifty has formed a Tweezer bottom if we take into account Monday and Tuesday’s candlestick formation. Both the indices had left behind a Measuring Gap i.e. between Sensex 17358-17664 and Nifty 5229-5323, the target for which has already been achieved. This gap is also a Bearish Falling Gap and hence is acting as a strong resistance area. Both Sensex and Nifty are above their short term average of 20dma (Sensex -16590 and Nifty – 4977), and hence the short term trend is up. The market is well below the medium term average of 50dma (Sensex – 17484 and Nifty – 5254) and long term average of 200dma (Sensex – 18476 and Nifty – 5543). As a result the medium term and the long term trends continue to remain down. The Pull-back was stopped in its track at Sensex 17211 and Nifty 5169 which is just below the first Resistance Zone at Sensex 17311-17448 and Nifty 5188-5230. 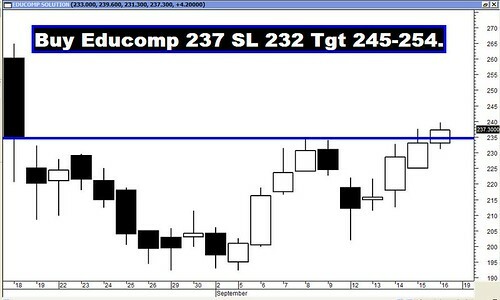 This zone is formed due to the convergence of various resistance levels. 50% of the immediate fall i.e. from Sensex 19131 to 15765 and Nifty 5740 to 4720, coincide with 38.2% of the intermediate fall i.e. from Sensex 19811 to 15765 and Nifty 5944 to 4720. These levels are further aided by the presence of the start of the falling gap. Above this, there exists a very strong resistance zone between Sensex 17664-17845 and Nifty 5323-5360. This resistance zone is formed by the convergence of the 61.8% of the immediate fall, 50% of the intermediate fall and 38.2% of the entire fall. This is further strengthened by the presence of falling gap. Thus we have second Resistance Zone between Sensex 17664-17845 and Nifty 5323-5360. From a broader perspective the market is correcting the entire rise from 7697 to 21108 for the Sensex and 2252 to 6338 for the Nifty. If the market breaches the current low of 15765 for the Sensex and 4720 for the Nifty, then the market is likely to move towards the 50% and 61.8% levels of the entire fall for the Sensex and Nifty. Those levels are 14402-12820 for the Sensex and 4295-3813 for the Nifty. Oscillators are presenting a mixed picture. MACD has given a Buy signal but is still in negative territory. RSI has just given a Buy signal as it has moved above the centerline and is currently at 51. ROC continues with its Buy signal by being in the positive territory. The Stochastic oscillator has given a Buy signal as %K is above %D. Directional Indicators have converged to a single point and may signal a Buy if +DI moves above –DI. ADX has fallen dramatically to 25 suggesting that the downtrend has lost lot of its strength. Money Flow is in buy mode as it has moved higher at 68, indicating money continues to flow in the market. OBV is not yet in Buy mode but it has formed a higher bottom. Nifty OI PCR has increased and is currently at 1.61. Highest Call writing is seen at 5200 strike price. High Open Interest has been added to the 4900 Put. Thus in the short term, one can expect the Nifty to oscillate between 5200 on the higher side and 4900 on the lower side. Trendline Resistance will at Sensex 17196 and Nifty 5157. Trendline Support will be at Sensex 16585 and Nifty 4973. For the week ahead, Sensex will find Support at 16549-16141-15765 and will find Resistance at 17246-17549-17857. For the week ahead, Nifty will find Support at 4965-4843-4720 and will find Resistance at 5177-5269-5373. All the recommendations reached their targets with the exception of HPCL. The Star performer of the week was SBI, which went up by more than 7%.